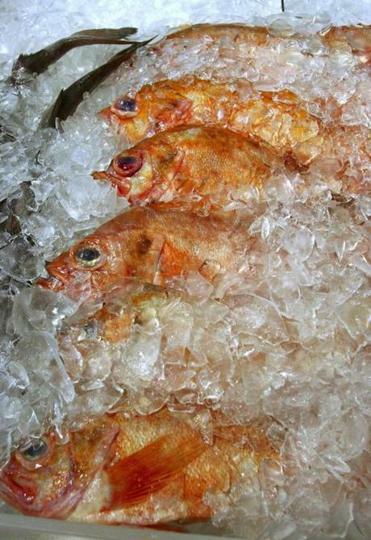 Ocean perch for sale at Harbor Fish Market in Portland. We were walking along Portland’s historic waterfront, on our way to the Harbor Fish Market. “This place is a real treasure,” Bagg said as we entered the market. “You’ll never see such high quality and low prices anywhere else.” Inside a wall of saltwater tanks was filled with live lobsters, and more than 50 feet of counters heaped with fresh-caught fish and seafood. Red snapper, flounder, scallops, shrimp, sardines, crabs, perch, calamari, bluefish, scup, haddock, striped bass, and something labeled cold Atlantic, fresh, whole “weak fish” rested on beds of ice. Ben Alexander poured a glass of mead during a mead tasting session at Maine Mead Works in Portland, Maine. We were on a culinary walking tour in Portland offered by Maine Foodie Tours. The 2½-hour jaunt through the historic Old Port and along the working waterfront introduced us to some of the city’s best purveyors and took us to its liveliest markets. Along the way we learned a little about the city’s unique and colorful history. We started with a visit to Vervacious (227 Commercial St., 207-221-3590, www.vervacious.com), a contemporary store specializing in hand-blended salts, rubs, mustards, and vinegars. Several years ago Heidi and Mark Stanvich, the husband-and-wife owners of the store, quit their day jobs, sold their house, and sailed the globe. When they returned, they started the business. “We make everything by hand right here in the shop, taking inspiration from spices and flavors we enjoyed around the world,” Heidi said. Bagg led us to the back of the store to sample some of the voyage-inspired seasonings. “Let’s start right out of the gate with the star of the show,” Bagg said, presenting a tray of mini lobster rolls, made of sweet lobster meat (bought that morning at the Harbor Fish Market), tossed with a little mayo, fresh lemon juice, and Vervacious harissa mustard. They were delicious, the perfect yin and yang blend of sweet lobster and spicy harissa. Next, we tried melon dusted with star anise sea salt and fresh pineapple drizzled with Vervacious espresso balsamic, an amazing, syrupy, smooth chocolate balsamic vinegar. To complement the food, we drank Portland Honeymaker mead from locally-owned Maine Mead Works (51 Washington Ave., 207-773-6323, www.mainemeadworks.com). “What do you think?” Bagg said. The group toasted and clinked, giving the smooth, sweet brew two thumbs up. The pretty little glass jars of spices proved irresistible; on our way out, we each bought a couple to take home (and received a 10 percent discount because we were on the tour). We walked out of the store into fog and drizzle, but no one seemed to mind. Raincoats came out and umbrellas went up as we walked several blocks to our next stop, the Public Market House (28 Monument Square, 207-228-2056, www.publicmarkethouse.com). This is a favorite go-to place for fresh veggies, fruit, and local specialty products. The store also has fresh bread and pizza counters, and an impressive cheese selection. “You don’t usually put cheese and Maine together in the same sentence, but there are a lot of small, award-winning cheese makers in the state. People just don’t know about them,” Bagg said. We were about to discover two of the state’s finest, when she presented a tray of cheese bites. The first was City of Ship cheese from Hahn’s End Cheese Co., a best-of-show winner in a recent national competition. The first bite was soft and mild, but the flavor intensified as we reached the naturally moldy, tangy rind. It was a winner in our book. We cleansed our palates with a pomegranate-cranberry herbal tea before tasting a mild, smoked blue cheese from Grindstone Neck Smokehouse, out of Winter Harbor, Maine. On our way out we sampled pieces of fresh-baked bread from the Portland-based Big Sky Bread Co.
Bagg, by her own admission, is a history geek. As we walked, she told stories of the city’s devastating 1861 Fourth of July fire, which left 10,000 people homeless, and many of the city’s wooden structures destroyed. 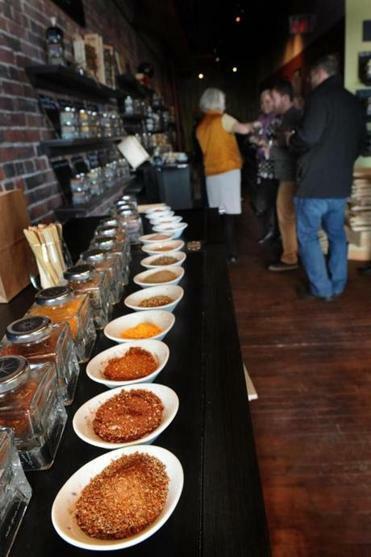 The Bagg’s Maine Foodie tourists can sample an array of mixes and rubs at Vervacious that reflects cuisines from around the world. When we stopped at Portland’s lobster statue she read from the diary of Governor William Bradford, which she’d found in the Portland Library archives. It dated to when Maine was still part of the Massachusetts Bay Colony. Our next stop was Stonewall Kitchen (182 Middle St., 207-879-2409, www.stonewallkitchen.com), where Bagg promised we would sample the best blueberry preserves and scones we’ve ever tasted. New England-based Stonewall Kitchen is a then-and-now, feel-good success story. It started with two guys, hand-picked fruit, and home-jarred preserves. Early on, founders Jonathan King and Jim Stott traveled to farmer’s markets and fairs to sell their homemade products. Today, the company has some 6,000 wholesale accounts nationwide, 11 retail stores, and hundreds of employees. We dug in, scooping an embarrassing amount of blueberry preserves on the scones. “That’s the best thing I’ve ever eaten,” one young woman on the tour commented, grabbing two boxes of scone mix and three jars of Maine wild blueberry preserves to take home. The rain stopped as we circled back to the waterfront and the Harbor Fish Market (9 Custom House Wharf, 207-775-0251, www.harborfish.com). 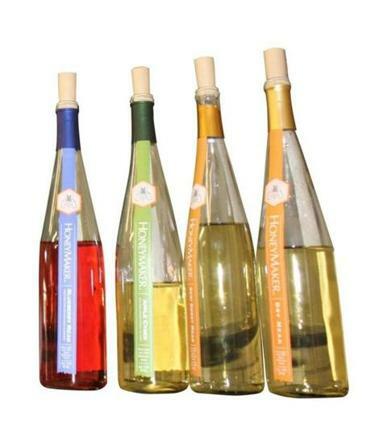 The Alfiero family has owned and operated the market for more than 30 years. Inside, Bagg netted a lobster and showed us how to tell a male crustacean from a female. We gawked at the fish displays, following Bagg to the rear of the store, where we tasted smoked mussels and tiny smoked shrimp from Ducktrap River of Maine. We ended our tour appropriately, with dessert. We whiffed the sweet-smelling air before we even reached the doors of Two Fat Cats Bakery (47 India St., 207-347-5144, www.twofatcatsbakery.com). We peeked into the tiny, crowded store, filled with racks of homemade fruit pies, before sampling the signature whoopee pies, filled with delicate, rich cream. Cheers! We lifted our nuggets in a final toast, before sampling our last bites. MAINE FOODIE TOURSoperates in three locations: Portland, Kennebunkport, and Bar Harbor. The 2½-hour Portland Culinary Walking Tour costs $45. 207-233-7485, www.mainefoodietours.com.